WITH Australians' growing love-affair with Rosé-style wines, Cumulus Wines at Orange in the NSW Central West have released their 2010 Luna Rosa Rosado that's a steal at just $12 for summertime enjoyment. And interestingly they brought out Portuguese winemaker Francisco Antunes from a Cumulus stakeholder, The Berado Group (also a stakeholder in arguably the world's most famous Rosé, Mateus) to work with Cumulus winemaker Debbie Lauritz on this moreish drop. The two decided on 40% Cabernet, 20% Grenache, 20% Mourvedre and the remainder Chardonnay, picking the fruit in the cool of night under a full moon – hence the name. This is a lovely fresh wine with a fruity perfume to enjoy chilled with a Sunday brunch seafood-filled omelette, or be adventurous and try it with Francisco's favourite: Portuguese salt cod fritters with aioli. ANOTHER luna touch for summertime pleasure is Western Victoria's Blue Pyrenees Luna NV bubbly, that again was made from fruit picked in the cool of the night under a full moon – and again hence the name. Predominantly Chardonnay (76%,) Pinot Noir (20%) and with a touch of the previous year's sparkling base, this is a Festive Season beauty with fresh lemon, shortbread and yeasty flavours that make it a nice match with party room hors d'oeuvres and most finger-foods. Well priced too at $18. INNOVATIVE winemaker Jeff Byrne at historic Hunter Valley maker Audrey Wilkinson has created an interesting blend for warm weather partying, bringing together Semillon from the company's own vineyards and Sauvignon Blanc from New Zealand's Marlborough. At $20 share this rewarding drop with cold summer seafood platters or bbq-grilled seafood and vegie kabobs. IF this is the year you've reason to treat yourself to some of the best of French Champagne with the Christmas turkey, give serious thought to a bottle of Champagne Taittinger's 2004 Brut Millésimé. This is a wonderfully flavoursome drop with aromas of lemon fruit jelly, mandarins and honey that follow through nicely on the palate; at $140 drop a hint that someone might like to leave you a bottle under the tree for a truly memorable Christmas – or do it yourself for that very special someone. And if $140 is a bit beyond the budget, pay just $16.99 and pop the cork on a McWilliam's Balance Brut Cuvee NV, a real value-for-money Aussie bubbly that's got the added advantage of being only eight per cent alcohol (compared with the norm of 11-to-14%) for those watching their intake, but still wanting plenty of nice citrusy flavours and sparkle in the glass. A MUST-GIVE for wine buffs this Christmas is Matt Skinner's Wine Guide 2011. This comprehensive guide to 250 wines for drinking now or cellaring for later, has excellent tasting notes, photographs, tips on what varieties and styles are the hottest in buying trends, and help and advice on eco and natural wines, low alcohol drops and low calorie wines. A consultant to buyers and consumers world-wide and contributor to leading magazines and newspapers here and overseas, Matt's reviews cover wines for all budgets and occasions – reds, whites, bubblies, pinks, sweet wines and light and full-bodied ones. A reference must at $24.95 for wine buffs. "MASTER of Hunter Valley Semillon," Neil McGuigan – lauded as 2009's International Winemaker of the Year – has now had his 2003 Tempus Two Copper Zenith Hunter Valley Semillon named NSW'S Wine of the Year 2010. A typically elegant McGuigan drop, this one's loaded with Hunter Valley lemon and lime flavours and complex honey characters. Well worth the $55 price tag to enjoy with grilled lobster basted with lemon-infused butter. A recent proliferation of wine show successes, as well as worldwide recognition stemming from awards and five star ratings, vigneron Graeme Shaw from Shaw Vineyard Estate in the Canberra Wine Region is set to have had a very fruitful year. Shaw Vineyard Estate is no stranger to international recognition, with recent international wine show success for the label in Vienna, London, Singapore and Shanghai - over 30 awards in total! Most notable is Shaw's amazing 6/7 medal haul at the world's largest wine show, the Vienna International Wine Challenge 2010 where a record 10,000 entries came from 34 countries. With 1 Gold and 5 Silver medals from this one almighty challenge, the Shaw's couldn't be happier. At the same time, right in their own backyard, Shaw Vineyard Estate was one of only 5 NSW wineries to have 2 wines named in the prestigious NSW Wine Awards Top 40, which was announced alongside the NSW Wine of the Year on Monday 18 October. By pure coincidence, both wines named in NSW's Top 40 are both Rieslings, which Graeme Shaw is adamant, will become the regions flagship white variety. He believes the fabulous site on the 700 acre fine wool property at Murrumbateman just north of Canberra is ideal for Riesling and Cabernet production in particular, and this award confirms that Riesling is certainly in its element in this locale. 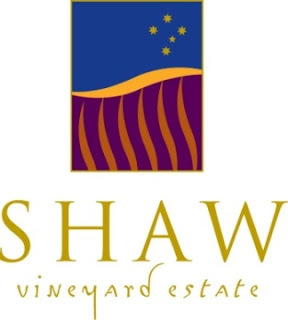 The Shaw Vineyard Estate Premium Riesling 2009 RRP $22 has an exceptional pedigree for a young winery, with the most recent 3 vintages producing Rieslings which have accumulated more than 30 medals and a Trophy. What's also pleasing is the Shaw Vineyard Estate Winemakers Selection Riesling 2009 RRP $15 was also named amongst the Top 40 NSW Wines, suggesting that it offers enormous value for money and that a wine which retails at only $15 can well and truly stand up amongst its peers. Of his success Graeme modestly admits "These victories are something I am very proud of as it has been no easy feat. A combination of hard work and intuition, as well as the relationships with reputable and innovative organisations around the world has assisted in catapulting the Shaw Vineyard Estate label to where it is now in only a few short years". Graeme Shaw personally attended the China International Small and Medium Enterprises Fair (CISMEF) this September to launch his highly esteemed five-star label into the China market. He followed on from this event to attend the launch of the brand in Europe with his new state of the art distribution and warehousing facility in the Netherlands now in full swing enabling his distributors based in Europe to access the wines directly and efficiently. There seems to be no stopping this dynamic vigneron from Canberra, and he looks forward to watching his label spread its wings in its new and existing markets. The award winning, five-star Halliday rated Shaw Vineyard Estate vineyard and cellar door is located just 20 minutes drive from Canberra city. Well known for producing cool climate wines, the estate was established in 1998 on the site of a historic 700 acre fine wool producing property called "Olleyville". A family owned and operated business, 85 acres of the estate is under vines and unlike most vineyards in the area it is elevated 640 metres above sea level, helping to protect against frost damage and allowing good air drainage over the property. Riesling, Semillon, Merlot, Cabernet Sauvignon and Shiraz are the hallmark varieties from the vineyard, each handcrafted with vigour by the winemaking team and displaying the cool climate characteristics of full fruit flavours, crisp acid structure and fine, silky tannins. Along with Graeme Shaw's passion for creating great, award winning wines is his commitment to enriching the lives of children living with cancer and their families as he donates a portion of money raised from the Shaw 'Laughter Series' wines to the Camp Quality charity. COLES Liquor is enjoying growing success with sales of Spanish boutique producer Segura Viudas' cavas (sparkling wines) that its been selling here since 2005. 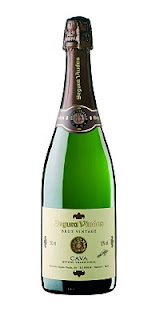 And a couple of these well-priced bubblies well worth considering for the upcoming Festive Season are the Segura Viudas Brut Reserva NV at $15 and Brut Vintage 2005 at $20. The Brut Reserva NV is a blend of three little-known varieties here, Macabeo, Parellada and Xarel-lo and is a favourite drink in Spain's Cataluna region where it's often enjoyed with late Sunday morning omelettes. It's also equally ideal with preserved clams, anchovies, and seafood over noodles and sprinkled with Arbequina Extra Virgin olive oil, or a warm quail salad. 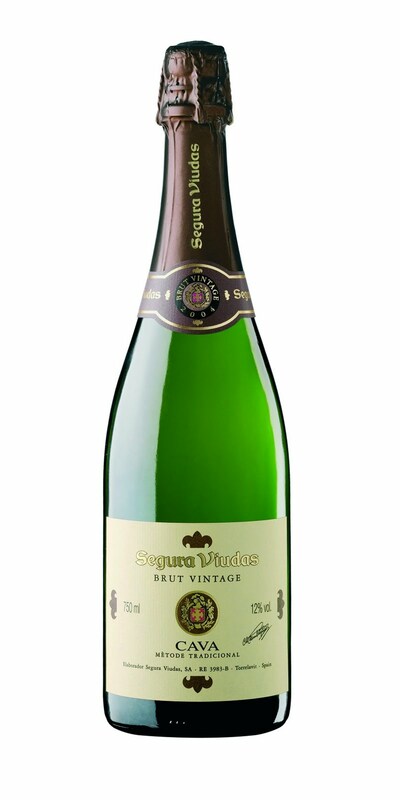 The Segura Viutas Brut 2005 is a Gran Reserva blended from ten separate ferments and aged in bottle for at least 40-monhts. Enjoy it with Iberian cured, acorn fed ham, griddled fresh tuna or lighter white goat's cheeses. a bargain buy at $11. ONE FOR LUNCH: Bargain hunters need look little further than Logans' Apple Tree Flat 2009 Chardonnay that really does over-deliver at just $11 a bottle. A blend of premium Mudgee and Orange (NSW) fruit, this is an enjoyable any-reason Chardonnay with enjoyable apple and citrus flavours. Match it up with summer salads or a seafood pasta. After the huge success of The Trucks wines in the States, creators 585 Wine Partners of the Napa Valley, California contacted their mates in Australia at Cheviot Bridge and suggested recreating the wines here. 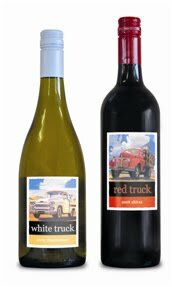 Cheviot Bridge loved the idea and immediately licensed the Red Truck and White Truck brands in Australia and put one of their most talented winemakers, Shane Virgo, in charge of putting an Australian engine in this American classic. Whilst the labels remain the same, featuring the appealing painting by internationally renowned Sonoma artist Dennis Ziemienski, the wines have become official Australian citizens being re-crafted from 100% South Australian fruit. Following the philosophy of the original wine, Shane and the team behind The Truck wines are serious about making great wine, but they don't take themselves too seriously. Shane confesses, "We had a great time jumping in our utes and driving all over the South Australian countryside in the sunshine, selecting the best quality grapes to use for these new wines." "Then the serious part kicked in and we went through a rigorous selection process. We tasted lots of different varieties and involving lots of different vineyards and winemaking techniques. We must have put over 50 different blends up on the bench at least 5 times, for each wine. The driving factor (pardon the pun) for selection was definitely quality but we did also keep in mind reflecting the original style of the wines - a smooth ride of big-hearted, bright, juicy flavours, full of youthful energy and fun. It is a great added bonus that the wines are also distinctively Australian, with Shiraz being selected for the red blend and Chardonnay for the white ," Shane says. The fruit for the 2008 Shiraz ended up being sourced from three vineyards; 60% from a gnarly old vineyard in the Barossa Hills, and then equally from one near the coast at McLaren Vale and one in Clare. The wine has a firmness and grip which delivers oomph and grunt. Chardonnay shone through for the White Truck wine and particularly fruit from the Angas Creek vineyard in the Adelaide Hills and an old Chardonnay site high in the Eden Valley. Half the wine was fermented and matured in French oak barriques and half kept in stainless steel to maintain freshness. Shane Virgo has definitely cranked up the gears to a new level and created bold, bright wines that will rev-up the palate and make any engine purr. The Dan Murphy's tasting panel certainly agreed with the quality and price, giving each wine a score of 94 points and agreeing to stock both wines. Their decision was backed-up by the 2010 Adelaide Wine Show where the 2008 Red Truck Shiraz also received a bronze medal. Blue Pyrenees have had to clear the shelves to make room for the countless accolades they have accumulated throughout the 2010 Wine Show season. At the 2010 Victorian Wine Show on Friday 22nd October, the Blue Pyrenees Cabernet Sauvignon 2009 was the star, winning Trophy for Best Cabernet in Show and a gold medal in its class. Although there was stiff competition in it's field, this prestigous award did not come as a huge surprise after also winning gold at the recent Adelaide Wine Show, Ballarat Wine Show and National Cool Climate Wine Show. The Blue Pyrenees Sparkling Shiraz NV was another big hit at the Victorian Wine Show, picking up the trophy for Best Sparkling Wine in show and a gold medal. This trophy has been known predominately to go to sparkling white wines, demonstrating that the Blue Pyrenees Sparkling Shiraz is a versatile wine of exceptional quality. At this same show, the Blue Pyrenees Cabernet Sauvignon 2008 also won the Top Gold in it's class after a very succesful year, most notably being recognised as Best Commercial Dry Red (classes 9 to 14) at the Macquarie Bank Sydney Wine Show earlier this year. And the list continues with more top gold, gold, silver and bronze medals being awarded to Blue Pyrenees from a range of wine shows across Australia, and they aren't expected to lose momentum anytime soon. Andrew Koerner, Senior Winemaker at Blue Pyrenees couldn't be happier with the results and commends his team on the all the hard work and commitment to creating wines of outstanding quality which have caught the attention of wine show judges, critics and consumers alike. "Again our Cabernet has managed to dominate wine shows across Australia and this has been no mean feat as the quality of our competitors is as tough as ever, " says Andrew of the recent accomplishments. "It just goes to show that this is a very strong variety for our region, and I maintain that very few Australian wine regions can make cabernet so consistently well". The team at Rymill Coonawarra are very proud that the newly released 2008 Rymill Coonawarra Cabernet Sauvignon won a gold medal at the 2010 Limestone Coast Wine Show announced 28th October 2010. The other two gold medals awarded in Class 14 were given to the 2008 Wynns Coonawarra John Riddoch and the 2008 St. Hugo Coonawarra Cabernet Sauvignon. Managing Director and great great grandson of John Riddoch, John Rymill said "We were delighted to be in such good company and thrilled that from the 47 entries in the class our Cabernet was only one of three awarded a gold medal". For more information please contact John Rymill, Managing Director, (08) 8736 5001. Created from premium parcels of fruit, aged in French oak barriques for 18 to 24 months. The resulting wine is lively and richly flavoured, perfect for drinking now but also demonstrating great promise for cellaring. Recognized world-wide by two majestic bronze stallions rampant, the Rymill family's distinctive winery produces classic thoroughbred wines made exclusively from grapes grown in its own Coonawarra terra rossa vineyards. – or a prize wine cellar. A MUST for the long-term investor, or those putting together a prize cellar for their own future enjoyment, is Katnook Estate's limited release 2006 Prodigy Shiraz. First made in 1997, with that release going on to win the Jimmy Watson Trophy the following year, this wine has been a consistent trophy and medal winner ever since. Sourced from a small single vineyard within Katnook's Coonawarra property, the 2006 enjoyed ideal conditions with slightly above-average temperatures that resulted in fruit of outstanding varietal flavour, good palate structure and subtle richness. It certainly vindicates winemaker Wayne Stehbens belief that while Shiraz may be more challenging in Coonawarra than Cabernet Sauvignon, ultimately Coonawarra Shiraz comes into its own. This 2006 has loads of dark berry and liquorice flavours with hints of raspberry, together with pepper and spice notes and balanced new oak. A good investment for the future at $95, or to enjoy with close family or friends over the Christmas turkey. ONE FOR LUNCH: IF you are already starting the shopping list for the Festive Season, jot down Logan's Weemala Brut NV in the bubbly column. This celebration drink has fragrant pear, crisp apple and citrus flavours from it's predominantly Chardonnay component, and there's a smaller amount of Pinot. Pay $22 and bring it out with an antipasto platter of white anchovies, olives, artichokes, salami, pecorino and goat cheese – or a summery seafood salad. BUBBLY idea for this year's Festive Season. The Red White and Blues Festival features a line-up of around 30 fantastic wineries from your favourite NSW regions including Mudgee, Orange, Cowra, Hasting's River and the Hunter Valley to name a few along with a great selection of gourmet food, regional produce and even boutique beers to complement the Wine tasting experience. PROLONGED periods of warm weather in Western Australia's Margaret River in 2009, punctuated by short, cool and dry spells, gave growers and winemakers wonderfully slow-ripened fruit with great concentrations of flavour and natural grape acidity for their 2009 labels. Evans & Tate have now-released three beautifully flavoured white wines from this vintage, with one – their 2009 Margaret River Sauvignon Blanc – already notching up a Trophy and six Golds on the show circuit. This is a wine loaded with passionfruit, lime and snow pea flavours, and with accompanying fresh grassy hints. The company's 2009 Margaret River Semillon Sauvignon Blanc has a similar core, together with herbal, gooseberry and nectarine characters. And the third of the trio, crafted by winemaker Matthew Byrne, is a Chardonnay with delightfully concentrated stone fruit flavours coupled with finer citrus characters and reflecting the differing characters of the sub-regions of the Margaret River from which he sourced his fruit. All three wines are value-buying at $22.99 a bottle; the Sauvignon Blanc and Semillon Sauvignon and both good seafood wines, and the Chardonnay will go will also make a good match with seafood or a gently-flavoured pasta. ONE FOR LUNCH: WYNNS have released a moreish 2008 V&A Lane Coonawarra Shiraz, so-named after the long straight road that was constructed in the late 1840s and which traditionally separates South Australia's Coonawarra North from Coonawarra's South. Winemaker Sarah Pidgeon has created a great drop with sweet red berry, plum and chocolate flavours, nicely supported with spicy oak… at $42.99 just the shot to linger with over a Sunday lunch of roast duck and baked vegies. PETER’S PITCH FOR HISTORY – ’OWZAT? WHEN lack of funds forced the sale of Coonawarra's historic old Penola Cricket Ground in 1996 just four years short of its 50th anniversary, Jim Barry Wines' Peter Barry bought the 12ha property to plant to Cabernet Sauvignon grapes. But he kept both the original pavilion and the pitch as important pieces of Coonawarra's sporting history, and has just released a Jim Barry "The Cover Drive" 2008 Cabernet Sauvignon to honour his vineyard's original owners. Made from fruit from the Penola property and vineyards in the Clare Valley owned by the Barry family, this is a generously-flavoured wine with loads of blackberry and black cherry fruit to the fore, distinctive Coonawarra cassis characters, fine-grained tannin and oak. It's value-for-money at $19 and will make an ideal accompaniment to a hearty Osso Bucco. ONE FOR LUNCH: WITH Pinot Gris' fast-growing popularity in Australia, Logan Wines' Peter Logan believes the variety could soon be equalling – or even outselling – that other hugely-popular white, Sauvignon Blanc. And his 2010 Logan Weemala Pinot Gris is good reason for his enthusiasm: a variety that responds well to nurturing in cold conditions such as those experienced by Logan at Orange in the NSW Central West, this one has lively fresh citrus flavours and nice white peach and honeysuckle aromas. "Pinot Gris is often the 'plain Jane' sister," Peter says. "But this one shows how 'plain Jane' can have a hidden beauty shine through." Pay $18 and enjoy with seafood dishes or curried sausages and mash. DRIVEN by history, a taste of history to enjoy with Osso Bucco. PLANE Jane's hidden beauty shines through with this one; match it with seafood. Hot off the Press: NSW Wine retail bottled wine sales within NSW have grown a staggering 22% or $14.3 million on the previous year to reach a record $79.3 million outstripping the State's growth of only 0.8% in the same period, showing NSW Wine has taken 21% market share from the other state producers including Victoria, South Australia and West Australia. This is a phenomenal result indicating the positive impact of the NSW Wine Strategy, guests at the 2010 NSW Wine Awards Gala Dinner at Guillaume at Bennelong were told last night. This previously unreleased Nielsen data MAT 31 August 2010 was revealed to the who's who of the NSW Wine industry, who also witnessed iconic Hunter Valley wine family McGuigan take out the 2010 NSW Wine of the Year with their 2003 Tempus Two Copper Zenith Hunter Valley Semillon ($55) and Doug McWilliam receive the Graham Gregory Award for his commitment to NSW Wine industry. Tiffany Nugan, Chair of the NSW Wine Strategy, spoke at the Awards and confirmed how significant this growth is. "It is so exciting to see how NSW Wine's sales growth is continuing to increase each year. This time last year NSW Wines sales within NSW grew by 12.8%, now they're growing by 22% showing the NSW Wine Strategy has serious momentum in the consumer's mind, with ever increasing growth each year." "Even more exciting is where the growth is happening. 60% of NSW Wine sales were in the $12-20 price point, growing by 23%. And even more impressively, the over $20 category showed a fantastic 56% growth. This proves our State's premium wines are really making an impact on the consumer, who is not only appreciating them but coming back for more!" "Last year the NSW Wine Strategy set a vision to double NSW Wine's distribution in our State within 5 years, to reach a similar representation level to states such as Victoria. If we continue to grow at 22% we will easily achieve this vision and NSW will be a place where visitors and locals alike will be able to enjoy a good, diverse and interesting representation of local wines in bottle shops and restaurants throughout the State." Tiffany Nugan was applauded for the achievements of the NSW Wine Strategy since its launch in February 2008 as Nugan announced she would be stepping down as Chair of the NSW Wine Strategy next month, with her successor to be announced shortly. Under Nugan's leadership the NSW Wine Strategy was conceived to increase the representation of NSW Wine's within our State and has seen the launch of the NSW Wine brand; NSW Wine Week, a major consumer event held in March each year, with the 'Sydney Cellar Door' event attracting 20,000 people to Hyde Park to taste NSW Wines; NSW Wine Uncovered Magazine published each August including James Halliday's Top 100 NSW Wines; the revamping of the NSW Wine Awards and a public relations campaign that each year attracts for the NSW Wine industry media coverage valued in excess of $8 million. The achievements of the Strategy, however, are best demonstrated by the sales growth. In February 2008 when the Strategy was launched NSW Wines sales within our home State were $52.4 million, today they are $79.3 million, showing sales growth of $26.9 million in less than 3 years. But the Award of the night went to Neil McGuigan for a standout Hunter Valley Semillon, the 2003 Tempus Two Copper Zenith Hunter Valley Semillon ($55). Neil is no stranger to awards nights having collected the title of both the 2009 International Wine and Spirit Competition "Winemaker of the Year" and 2009 International Wine Challenge "White Winemaker of the Year", but he was particularly proud to collect one of his home-state's highest honours on behalf of the McGuigan family's Hunter Valley brand, Tempus Two. The NSW Wine Awards Chief Judge Huon Hooke, one of Australia's most experienced palates who judges several competitions each year both within Australia and internationally, supported the quality of the Tempus Two Semillon and all the Trophy winning wines at the Awards. Whilst commenting on the calibre of this year's judges and the stringent tasting procedure used to reach the final decisions he said, "I confidently and proudly commend the wines here tonight. These winners can hold their own at any wine show in the world." Friday night was Merilba Estate's night of nights, taking home two of the three most coveted awards at the New England Wine Show, held each October in Glen Innes to recognise the new and emerging regions' winemaking prowess. 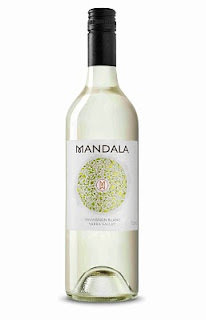 Winning the much sought after Trophy for White Wine of Show, the 2010 Merilba Estate Semillon Sauvignon Blanc RRP $20, also took home a gold medal for a wine that has been in bottle a little less than one week. Also a shining star on the night, the 2010 Merilba Estate Shiraz RRP $20 also won the award for Best Young Red Wine of Show after topping the class and gaining a silver medal along the way. Merilba Estate, owned by Shaun & Kassy Cassidy is a relatively new entrant to the New England scene, but has been earmarked as one to watch. The Cassidy's have created one of the region's leading food and wine destinations at their property near Kingstown just west of Uralla, having recently opened a stunning restaurant and cellar door facility on their vineyard and cattle property. Producing just over 3800 dozen bottles of wine in their 8th vintage, the 2010 vintage is sure to position Merilba Estate as a leader in the region. The property, of which approx 12 hectares was planted to vine in 1998, produces classic varieties of Chardonnay, Semillon, Sauvignon Blanc, Shiraz and Cabernet Sauvignon as well as some newer and emerging varieties to the region, Tempranillo and Gewurztraminer, which Shaun firmly believes are some of the most exciting styles coming out of the region. Shaun Cassidy also makes wine for several other leading local wineries including Mihi Creek and Thunder Ridge who also took home a swag of medals on the night. All three wineries are founding members of the New England Australia wine brand which is to announce its regional brand strategy at a celebration in Armidale on 26th October. The NEW (New England Wine) regional brand has been created as a result of the New England Australia having recently been named as one of Australia's newest, largest, highest and coolest Geographical Indicators (GI) and designated by the Australian Wine and Brandy Corporation as such. A group of the regions enthusiastic grape growers and winemakers together with their active viticultural organisations, local industry, councils and Industry & Investment NSW have funded a comprehensive review of the regions wine and wine tourism industry, and a Sydney based wine marketing company, Winestream Communications has developed a new regional brand and strategy which will give the New England Wine region the ability to compete on the world wine stage for many years to come, and be recognised as a leading emerging wine region. Merilba Estate Wines are available from Cellar Door and various local retailers. Merilba Estate is seeking distribution in other markets. 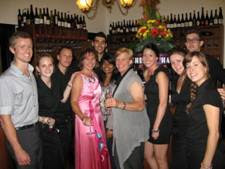 Melbourne-based Boutique Travel Agency Food and Wine Travel is Pioneering Food and Wine Based Travel to South-America. Realising the vast potential of South-America for the food-minded traveller, Karen Ridge of Food and Wine Travel has taken a leading role in bringing the destination within Australia's reach. With the influx of award-winning South-American wine onto the Australian market, comes the realisation that these two countries harbour some world-class attractions for the devote 'foodie'. And it's not just the wineries that will get the gastronome excited; both countries have a rich food culture too. "The sounds and sights in this part of the world are truly unique", says Food and Wine Travel's managing director Karen Ridge. The majestic Andes mountain range function as the anchor, cradling the various wine growing area's with its snow-capped mountains. "If you thought the Alps were scenic, think again" she continues. Although a developing wine growing area, some of the wineries are steeped in history and exude a distinctive European vibe due to the efforts of French viticulturalists in the past. Add to that a splash of Latin spirit and you have a unique destination. More importantly they produce fabulous wines which get better and better every year, plus it's backed up by a fantastic food culture of asados (barbecued meats) and fresh seafood. With Argentina and Chile as the main destinations on the continent, Food and Wine Travel is steadily increasing its travel options. More itineraries will be released in the very near future. "I intend to be on the forefront of developing the continent as a gastronomic destination as I believe strongly in its' merits" concludes Karen Ridge. With 20 years of experience in the travel industry, Karen Ridge began Food and Wine Travel in 2008 in response to a need she saw in the travel market for unique, memorable, individually tailored holidays, based around food and wine experiences. Food and Wine Travel prefers to design tours to suit the client's personal preferences. Her customers appreciate the finer things of life, enjoy quality food and wine and they know that she will ensure they have the best possible experience on their gourmet holiday. Food and wine travel is an innovator in the field and prides itself on its varied range of travel options. BEST'S Wines in Victoria's Great Western have been producing outstanding Rieslings since 1866 when their original owners planted their pioneering young vineyards with cuttings they'd brought out from Germany. And interestingly only two families have owned the Best's label since then: the Best's themselves to 1920, and the Thomson family who bought it then, and who in turn have owned it through five generations, the latest of whom are now the guardians of vines that are amongst the oldest in Australia. Their 2010 Great Western Riesling is another stand-out wine from what winemaker Adam Wadewitz describes as "an outstanding growing season." Early ripening meant the fruit could be picked at lower sugar levels, meaning wonderfully forward lemon and lime blossom flavours and nice acid balance. With such a flavoursome front palate this is a wine that can be enjoyed with a range of dishes from spicy Asian through to crabmeat fritters, baked or barbecued pork, or even cold white-meat salads. Certainly great value to enjoy at $25, and to reminisce on a taste of history. ONE FOR LUNCH: THE Hunter Valley's Ballabourneen have released a Shiraz they've named after their rising-star winemaker, Dan "Buckets" Binet. This 2007 Buckets of Hunter Shiraz is loaded with rich dark-fruitcake flavours of cooked plums, cedar oak, chocolate and hazelnuts. A TASTE of history with spicy Asian dishes or crabmeat fritters. BUCKETS of flavour in this one from a Hunter Valley "rising star." now 2010 NSW Wine of the Year! Last year, McGuigan, one of New South Wales' (and Australia's) icon wine families brought the world's gaze back to our State's wines claiming in London the title of both the 2009 International Wine and Spirit Competition "Winemaker of the Year" and 2009 International Wine Challenge "White Winemaker of the Year". Tonight the McGuigan family is staking its claim as the State's best producer collecting the Trophy for the 2010 NSW Wine of the Year with its 2003 Tempus Two Copper Zenith Hunter Valley Semillon ($55). The McGuigan's are one of Australia's best known wine families, with their roots firmly planted in the Hunter Valley. The family love affair with winemaking began with Owen McGuigan, a dairy farmer, who was born in the Hunter Valley in 1869, and laboured in the local vineyards in order to support his wife and six kids. Since then a further three generations of McGuigan's have made wine their life including household names, Brian & Fay McGuigan, Neil McGuigan and next generation Lisa McGuigan, who conceived Tempus Two. Industry recognition for this great wine family has been immense. Perce McGuigan (Owen's son) is an inaugural Hunter Valley Living Legend for his part in shaping the Hunter Valley's prominence during his time working for Penfolds. 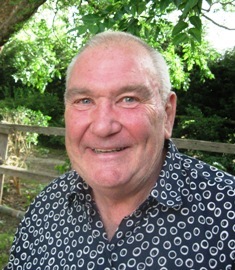 Brian McGuigan (Perce's son) was responsible for launching McGuigan Wines and has been awarded the Australian Medal and Hunter Valley Living Legend status. Similarly, Brian's wife, Fay, who was responsible for McGuigan exports, has been honoured as a NSW Telstra Businesswoman of the Year and Australian Export Hero. Neil McGuigan (Brian's brother) is now CEO of Australian Vintage (producers of both the McGuigan and Tempus Two brands among others) and under his reign McGuigan Wines has been recognized as one of Australia's best wine producers including "International Winemaker of the Year" at the 2009 International Wine & Spirit Competition in London. As CEO of Australian Vintage, Neil gets to work in some of the most technologically advanced wineries in the industry. However, Tempus Two remains a boutique winery in the Hunter Valley, specializing in small batch production, and the treatment, maturation and bottling of super-premium wines. Responsible for the creation of the 2003 vintage was talented winemaker Sarah-Kate Dineen (now based in New Zealand) ably assisted by Liz Jackson (another Hunter Valley local, now at First Creek winery). Liz is a star to watch as she also made the 2009 & 2010 First Creek Winemakers Reserve Semillons, which both secured spots in the hotly contested NSW Top 40 Wines, with the later carrying home the Trophy for Best Young Semillon – a proud hat trick for a young winemaker. The 2003 Tempus Two Copper Zenith Hunter Valley Semillon is no stranger to success recently collecting 3 Trophies at the 2010 Hunter Valley Wine Show. It is the pinnacle of classical aged Hunter Valley Semillon: vibrant lemon and lime notes with floral undertones and complex honeyed characters developing. Citrus fruit flavours with toasty characters, balanced by a lingering acid backbone. Everyone can taste the NSW Wine Awards winning wines at the 'NSW Wine "Best of the Best Top 40" Tasting' on Thursday 21st October. A great way to be amongst the first to discover the finest new wines of NSW, including winemaker-hosted Top 40 wine tours. When: Thursday 21st October, Museum of Contemporary Art, 140 George Street, The Rocks, Sydney. Trade & Media tasting : 2- 4pm, pre-registration compulsory. Consumer tasting : 5- 9pm, $50pp including NSW Wine glass, winemaker-hosted Top 40 wine tours, wine and canapés. Book: www.nswwine.com.au for more information and tickets. TIM Adams Wines have released a ripper 2009 Semillon from their Clare Valley heartland, a wine that's what Clare Semillon is all about. Somewhat different to Semillons from such major growing areas as NSW's Hunter Valley, Clare Valley Semillon can be "more robust" – as is the case with this one – and often with more concentrated fruit flavours. This wine's also got some nice notes to it from its oak maturation. At $22 grab a bottle of this Tim Adams and put it on the table with your favourite pan-fried white-fleshed fish. You'll find the intense tropical fruit flavours go wonderfully with your fish choice – or if you're not into fish, enjoy it just as much with simple roast chicken and mashed potatoes infused with a handful of chopped parsley, or a baking pan of roast vegetables. ONE FOR LUNCH: PENFOLDS first started making their now-famous Bin 28 Kalimna Shiraz a half-century ago, at the time with fruit exclusively from the Barossa Valley's Kalimna Vineyard it had bought at war's end in 1945. Today Bin 28 is as popular as ever and a showcase of warm-climate Australian Shiraz, but is a multi-region, multi-vineyard blend embracing South Australia's Langhorne Creek, Upper Adelaide, McLaren Vale, Limestone Coast – and with the Barossa still very much to the fore. The latest release, the 2007, is the product of a difficult vintage with low winter temperatures followed by an unusually hot summer, but through which winemaker Peter Gago and his team maintained the label's esteemed image. This is a wine with generously concentrated red and black berry fruit flavours, some earthy notes, and aromas almost like uncorking a rich Christmas cake. At $33.99 it's just the drop to enjoy with something out of the ordinary like a homemade boeuf en croute, or a nice piece of chargrilled rare rib-eye. The nine Trophy Winners in the 2010 NSW Wine Awards have been revealed today in the closing battle to be the 2010 NSW Wine of the Year and it looks set to be a neck and neck fight, new vs. established wine regions, with only 12 days remaining until the 2010 NSW Wine of the Year is announced. These Trophy winners were chosen from the NSW Top 40 Wines, which were selected by a panel of 20 highly regarded wine judges, including Huon Hooke (Chair), Iain Riggs, Peter Bourne, Philip Shaw, Mike De Garis and Nick Bulleid MW. These expert palates whittled down over 800 wines to this impressive shortlist. The Trophy winners reflect the NSW Top 40 well, being an almost even split between the new, emerging cool-climate NSW wine regions – such as Orange, Tumbarumba and Canberra - and the more established, well-known regions of the Hunter Valley and Riverina. The 2010 Trophy Winners will be presented with their awards on Monday 18th October at the NSW Wine Awards Gala Presentation Dinner at Guillaume at Bennelong, where the coveted 2010 NSW Wine of the Year will be also be announced for the first time. Can you pick the 2010 NSW Wine of the Year? Taste the NSW Top 40 Wines at the 'NSW Wine "Best of the Best Top 40" Tasting' on Thursday 21st October. A great way to be amongst the first to discover the finest wines of NSW, including winemaker-hosted Top 40 wine tours. Where: Museum of Contemporary Art, 140 George Street, The Rocks, Sydney. Trade & Media tasting 2- 4pm, pre-registration compulsory. Consumer tasting 5- 9pm, $50pp including NSW Wine glass, winemaker-hosted Top 40 wine tours, wine and canapés. The original and best, Hugh Johnson s Pocket Wine Book 2011 successfully distills the world of wine into a handy, eloquent gem of a package. The original and best, Hugh Johnson's Pocket Wine Book is the ultimate compact guide. Now in its 34th edition, it is the UK's number one wine book appealing to wine-lovers and professionals alike. it is the key reference for enthusiasts, investors and collectors and this year's edition boasts up-to-date news on more than 6,000 wines, growers, and regions, plus invaluable vintage information from experts around the world. A new colour supplement focuses on the array of wines from Spain,while a new section offers the reader alternative wines to try based on those they already drink. 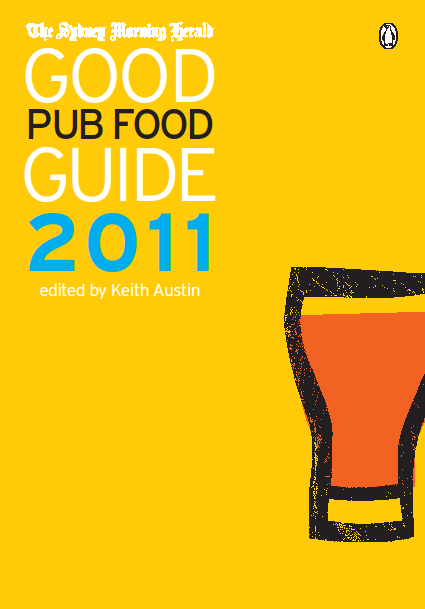 More than 200 of Johnson's favourites for 2011 are also included. Hugh Johnson's winning formula of insight, critical appraisal of the world of wine, plus vintage news has never been bettered. During the past four decades he has written many books that have become landmark titles, including his classic the World Atlas of Wine, co-authored with Jancis Robinson and published this year in a new compact format as the Concise World Atlas of Wine, and his Wine Companion, which is fully updated for 2010. Howard Park's flagship Riesling, first produced in 1986 has scooped a Gold Medal at the renowned Rutherglen Wine Show with this year's release. The Gold Medal adds to the growing list of accolades for the 2010 Howard Park Riesling that already includes two coveted trophies from the Perth Royal Wine Show for the Best 2010 Vintage Dry White Table Wine and the Best West Australia White Table Wine. "The 2010 Howard Park Riesling is made from grapes grown on our site - Mt Barrow, which is managed in an environmentally friendly manner. We are delighted that this site is only 5 years old and yet delivering so early in the life of this special vineyard. We look forward to our future with excellent Rieslings. "The Rutherglen Gold Medal and Perth Royal Wine Show trophies are a great honour and add resonance to Howard Park's philosophy of always providing excellent fruit for premium wines. Congratulations to our viticultural team." "The Rutherglen Wine Show has been running for over 120 years and is recognised by wine producers and wine consumers as one of the major wine shows in Australia. The West Australian wine industry involvement reflects its growth, mirrors and provides wine enthusiasts with insights into the best available on the market." This year's Rutherglen Wine Show had well over 2,000 entries. Howard Park Wines are available for purchase via www.howardparkwines.com.au or by phoning Negociants on (08) 8112 4210. ASK most winemakers in the Hunter Valley about the 2008 vintage and they'd more than likely tell you it was one they'd happily forget about – except Andrew Margan who got the fruit for his White Label Shiraz Mourvedre off the vines before the arrival of the rains that did so much harm to others' crops. Andrew's two grape varieties are inter-planted and always picked together, in 2008 yielding around just a tonne of quality fruit from every hectare of the 40 year old vines. When made into wine it was good enough go to under the Margan Family Winemakers' White Label that was created in 2003 purely for small batches of wines that stand-out from others in the Margan range. The 2008 White Label is 85 per cent Shiraz and 15 per cent Mourvedre, resulting in nice spicy-savoury flavours from the Shiraz and a dusty richness from the Mourvedre, while savoury tannins balance out the middle palate. Pay $30, and as Andrew Margan himself enjoys, serve with an exotic but easy to make sauté of white beans, Spanish morcilla, scallops and picada. ONE FOR LUNCH: A VINEYARD planted to Chardonnay amongst the predominantly red vines of Coonawarra is used by Brand's to show just how happily this block has found itself at home in generally red-wine country. The 2008 Brand's Laira is a bigger-style Chardonnay, full-bodied with vibrant stone-fruit flavours and hints of cashew nut and creamy oak characters; at $21.99 it's excellent buying to enjoy with crisp-skin salmon, garlicky mashed potatoes and steamed asparagus.